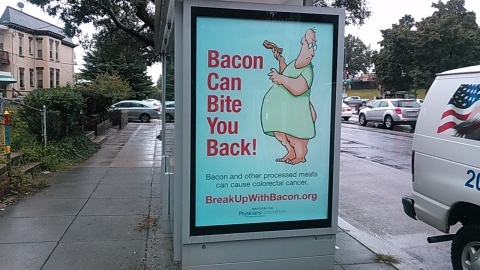 WASHINGTON--(BUSINESS WIRE)--Hard-hitting bus shelter advertisements near D.C. hospitals will urge patients and others to #BreakUpWithBacon to prevent colon cancer. The ads warn “Bacon and other processed meats can cause colorectal cancer,” and “Bacon can bite you back!” The bus shelter ads, scheduled to start going up the week of Sept. 24, are sponsored by the Physicians Committee, a nonprofit with 12,000 doctor members. Numerous print, radio and TV ads are also appearing during September and early October. The colorectal cancer rate for African Americans in the District is nearly triple that for whites—59.1 versus 22.1 per 100,000. Similarly, the incidence of colorectal cancer in Ward 8 is roughly three times higher than in Wards 2 and 3. 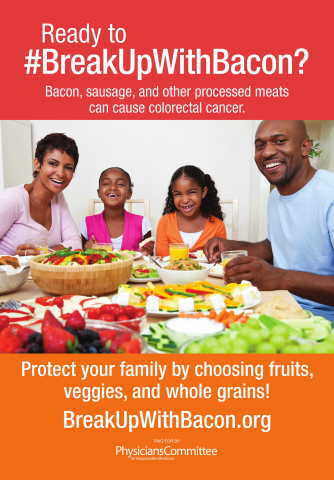 The campaign aims to reach the entire District, but additional ads target the wards hit hardest by colorectal cancer. For a copy of the advertisements or an interview with Neal Barnard, M.D., F.A.C.C. or another expert, journalists please contact Sierra Coppage at 202-527-7319 or scoppage@pcrm.org. Founded in 1985, the Physicians Committee for Responsible Medicine is a nonprofit organization that promotes preventive medicine, conducts clinical research, and encourages higher standards for ethics and effectiveness in research and medical training.